The Fourth of July is this weekend, which means plenty of friends, fun, and backyard BBQs. However, many cookout side dishes are high in calories and low in nutrients. Kooi recommends these four healthy side dishes that help you enjoy the summer festivities but don’t bust your diet. 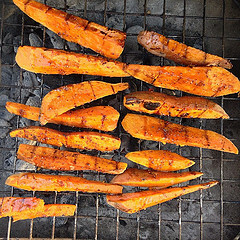 Grilled sweet potatoes contain beta-carotene, an antioxidant that the body converts into Vitamin A. To prepare, boil the potatoes in water until fork-tender and slice into lengthwise wedges. Coat the potatoes with a light layer of canola oil and grill for two to three minutes on each side. For an extra flavor kick, Kooi recommends adding finely grated lime zest and ground cumin to the canola oil prior to coating the potatoes. Image courtesy of Stephen Depolo. Because watermelons and cucumbers are mostly made up of water, this salad helps fill you up without filling you out. 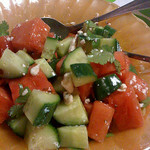 To prepare, mix small cubes of cucumbers and watermelon with minced mint in a large bowl. Drizzle balsamic vinegar and toss to coat. Image courtesy of citymama. Packed with protein and antioxidant-rich herbs, this creamy, cool dip is a healthy alternative to traditional high-calorie dips like ranch dressing. To prepare, simply mix plain, low-fat Greek yogurt with two teaspoons of lemon juice, chopped dill, chives, and fresh basil. Serve with crisp vegetables or whole wheat pita chips. Short on time? 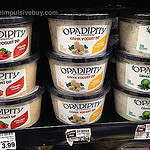 You can buy packaged dips like this at your local supermarket. They may not be as healthy, but they’ll be better for you than alternatives. Image courtesy of theimpulsivebuy. If you really want a burger on the Fourth, this is not for you. But if you have vegetarians at your cookout, grilled portobello mushrooms make a great meat alternative because of their meaty-like flavor that research has shown increases satiety. 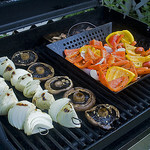 To prepare, marinate the mushrooms in a mixture of olive oil, minced garlic, and balsamic vinegar prior to grilling. Image courtesy of woodleywonderworks. I made these for a cookout last year, and they were a hit! 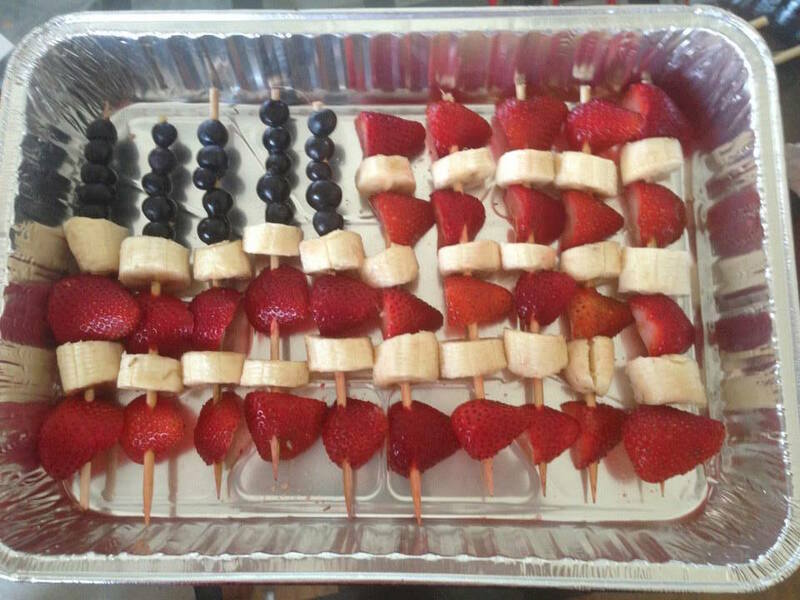 Simply cut the strawberries and bananas into pieces, then make a flag by sliding the fruit onto kebob skewers. Sweet, delicious, healthy, and festive! Do you have any other waist-friendly Fourth of July sides? Share in the comments! There are so many expensive calorie-counting, eating pace-controlling devices and apps out there now, but a new plate sticks to simple lines to help you eat healthier. ETE is a well-designed plate that keeps things old-school by using visual markers to make sure you’re eating well-balanced portions. The plate, which was created by a Singapore-based team, has colorful lines that outline the ideal portion of food items per meal based on U.S. and European Union recommendations. The lines help people to visualize how much of certain things they should be eating. This is especially noticeable for vegetables, which are often absent from many meals. ETE is designed to serve as a guide though rather than an ultimatum for every meal; as such, certain things, like dairy, are noticeably absent. ETE plate is currently in the middle of its Indiegogo campaign, with over one-fifth of its funds raised in the first few days. One plate currently starts at $15 for the early bird price. The new SmartPlate and microwaveable lid. | Image courtesy of Fitly. 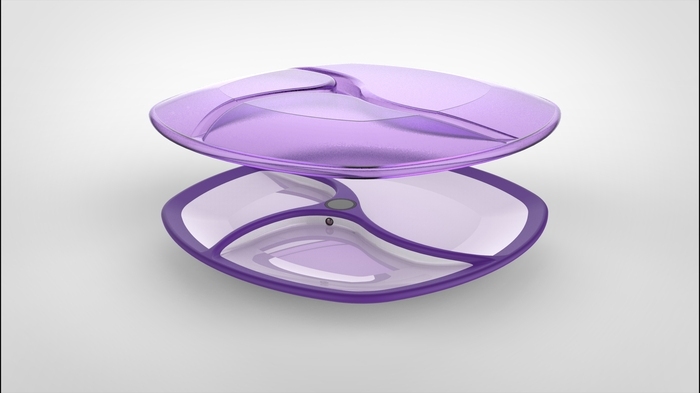 SmartPlate by Fitly is a Kickstarter project that automatically weighs and tracks the food you consume. 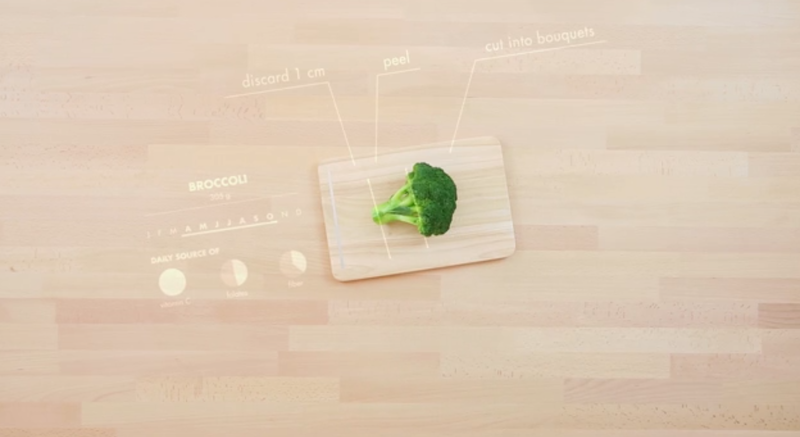 The concept is simple – just place what you want to eat on the plate, then cameras and sensors gather the food’s data and pushes it to a smartphone app. That way, you know exactly how many calories, carbs, sugars, fats, etc. you consume throughout the day. The plate also alerts you if you’re eating too quickly. 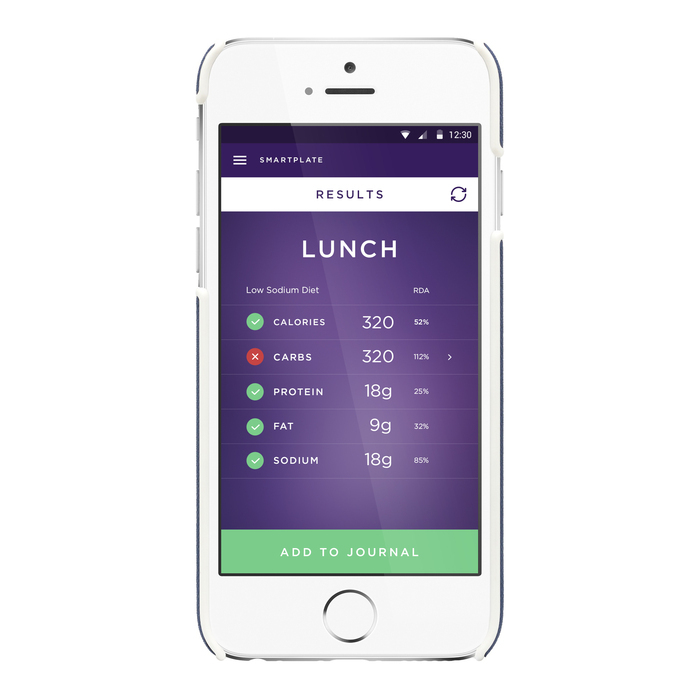 The SmartPlate app. | Image courtesy of Fitly. The plate pairs with a smart phone device, which stores and tracks all your data. Through the device, you can set goals, like to lose or maintain weight, train for a marathon, or follow a specific type of diet. The website and Kickstarter campaign page don’t delve into whether the plate has ben independently tested, and SmartPlate is unfortunately not microwaveable. However, each plate does come with a microwaveable lid, to hopefully alleviate that drawback. The SmartPlate is currently in the middle of its Kickstarter campaign to raise production funds for the product. So far, Fitly has raised about a quarter of it’s goal, and there’s over a month left on the campaign. The plates are currently going for $99 on the campaign page, and they will retail at $199. Fitly expects the SmartPlate to be available in 2016. 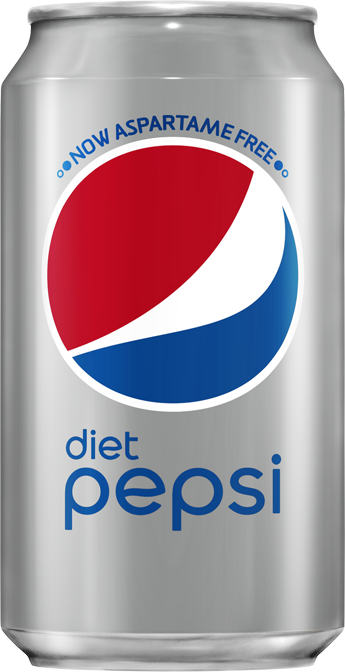 Diet Pepsi will be made without aspartame starting in August because of changing consumer demand. While it’s great that consumers are concerned about what they are drinking, replacing aspartame with another sugar substitute may not be the best option. Aspartame, an artificial sweetener, has been highly tested and is regarded as safe for most people by the U.S. Food and Drug Administration, but public concern over the sugar substitute has led PepsiCo to make a change. Instead, Diet Pepsi will soon be made with the lesser-tested sweeteners sucralose (essentially Splenda) and acesulfame potassium. While both sucralose and acesulfame potassium have been approved for use in food and beverages in the U.S. , they haven’t been studied to the amount that aspartame has. The change, while getting rid of aspartame, may not make Diet Pepsi any better or worse for health. What does not change though, is that diet sodas like Pepsi are not a healthier version of sugar-sweetened soda, and by simply switching the sweetener, it will not help anyone lose weight. In the recently redone World Health Organization (WHO) guidelines, the organization calls for sugar to be only 10% of a day’s energy intake, about 25 grams. A can of normal pepsi has 41 grams of sugar, and although diet pepsi may technically have 0 grams with (or without) aspartame, again that does not mean it’s good for you. As with anything else, if you’re going to drink a soda, the best thing to do is to drink in moderation. Is Meal-Planning App Zipongo With The Hype? 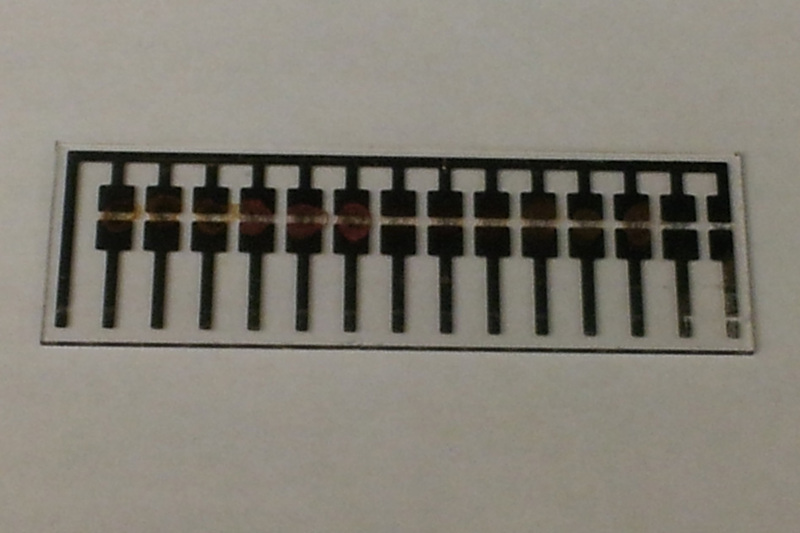 MIT researchers are at it again – this time by inventing a sensor that detects spoiled meat. The sensor, which was developed by a team of chemists, is portable and can detect gases emitted by rotting meat. This allows consumers to determine whether the meat in their refrigerator is safe to eat. The researchers put their sensor to the test and found that various mets last over four days in the fridge but decay at different rates when left out. They recently published their findings in a scientific journal and have filed a patent for the technology, hoping to license it for commercial use. The chemists foresee their sensor being used on “smart packaging” that displays more accurate safety information than an expiration date. They also hope it can cut down on food waste because people throw things out that aren’t bad, just based on the expiration date. The sensor may also be incorporated into a wireless platform developed by the same lab that enables a smartphone to read the freshness of the meat, making it easy for consumers to tell whether or not to cook that piece of chicken. This isn’t the first sensor that the lab has detected for freshness either. The lead researcher and others have also created one to detect the ripeness of the fruit. Screenshot of A Table For Living video on Vimeo. In August 2013, IKEA and IDEO brought students from various international universities together to answer some important questions: What will life around food look like in 2025? Will we be able to help people like healthier, more sustainable lifestyles? It was up to the students to re-imagine life and the kitchen in 10 years. In the end, the students’ ideas were featured on the collaboration’s website, Concept Kitchen 2025. The students share a very interesting and optimistic view of where we’ll be in the next decade. Below are two that are particularly mind-blowing. What is A Table For Living? One that acts a phone charger, kids toy, stove top, coffee warmer, and tablet, of course. The students who designed this concept table really imagined it as being the center of kitchen life and functional in many, practical ways. The Table For Living can do quite a bit, including suggesting recipes based on the food items you place on it. You can also pick a meal you want to make, and the table will project various versions of the recipe based on your ingredients, and how long you want to spend cooking. Oh – and the designed table also measures out some foods for you. In addition to being your new cooking helper, the table is designed to have induction built into the top, so that you can cook food as you’re making and prepping it – right on the same surface. It can also charge phones or serve as a way for kids to animate their toys. What if your kitchen shelves kept your food cool? Well, in another design to come out of the program, they can. The ‘Casual Technology’ shelving uses storage containers that can be cooled using induction, meaning that you may not need a fridge in 2025. Just place your food and beverages inside the boxes, and the shelves can keep them at just the right temperature. Even better, the containers are designed to work with the Table For Living so that you can grab that piece of leftover pizza from the shelf and heat it up in its container right on the table. Now that sounds convenient. I encourage you to check out other concepts from that came out of the program. Although these technologies will probably not make it to the consumer in their current forms, IDEO and IKEA do know how to get things done, and in 10 years, we may see products similar to these in our kitchens. Want to stay up-to-date with latest health/tech trends? Get emails when new posts get published, then follow Crunch Theory on Facebook and Twitter. Meld takes the guess work out of cooking. Meld turns your ‘dumb’ stove into a lean, mean, cooking machine. By simply changing your stove’s knob, Meld can make sure your food cooks at just the right temperature. Meld is an automatic temperature control system that works with your existing cookware to monitor and control temperature throughout cooking. That way, you can use your ordinary pot as a slow cooker or to perfectly simmer your dinner. The system consists of a clip, knob, and smartphone application. The clip, which can monitor your pot’s temperature, attaches to your current cookware. Then, by replacing your stove’s nob with a Meld one, the smart knob can make sure your food cooks at just-the-right temperature. Finally, the app can tell you exactly what temperature your food is at, when it’s time to start or stop a dish, and has hundreds of recipes just for the system. The company’s website says Meld can be used for slow cooking, frying, poaching, sous vide, simmering, and candy making, but I’m sure you can find other creative ways to use the system. And if for some reason you want to cook the old-fashioned way every once in a while, you can use the Meld knob like any other knob simply by not using the clip. Meld is currently in the middle of a Kickstarter campaign, and it’s already blasted past its $50,000 goal. You can preorder the system from their campaign page for $129 (it’s expected to retail for $149), and preorders ship in the fall. KitchenBowl shows you how to make recipes step-by-step. Although you can’t eat them like Jif peanut butter, gifs can still be a handy tool when learning to cook meals for the first time. That’s why Kitchenbowl is a great startup for those who want to try making something new in the kitchen. The website, which raised $1 million in funding last week, shows you how to cook meals step-by-step with pictures and gifs. The images help to make sure you’re following more complicated recipes to a tea. A step of ethanstowell’s homemade gnocchi recipe. A good example is a featured recipe for homemade gnocchi. The instructions show you how to do things like mill potatoes using a gif, which not only looks cool, but also taught me what the fudge a food mill was and how to use it. And if you’re a cooking pro or perhaps just an enthused amateur, you can create your own recipes with pictures and gifs to post on the site. 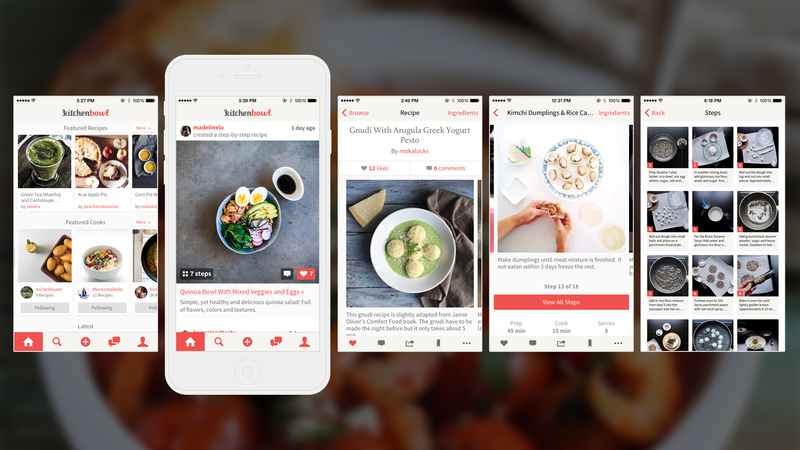 It also works like a social network, where others can like and share your recipes. Kitchen bowl launched last November and was rated as one of the best new apps in December 2014. 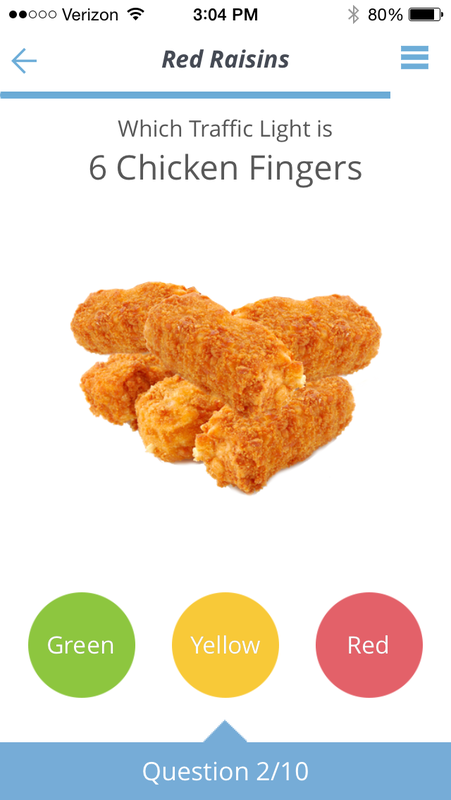 You can download for the app from the App Store or check out recipes from their website. Is Meal-planning App Zipongo Worth The Hype? Let’s Pizza is a pizza vending machine. Image courtesy of Let’s Pizza. 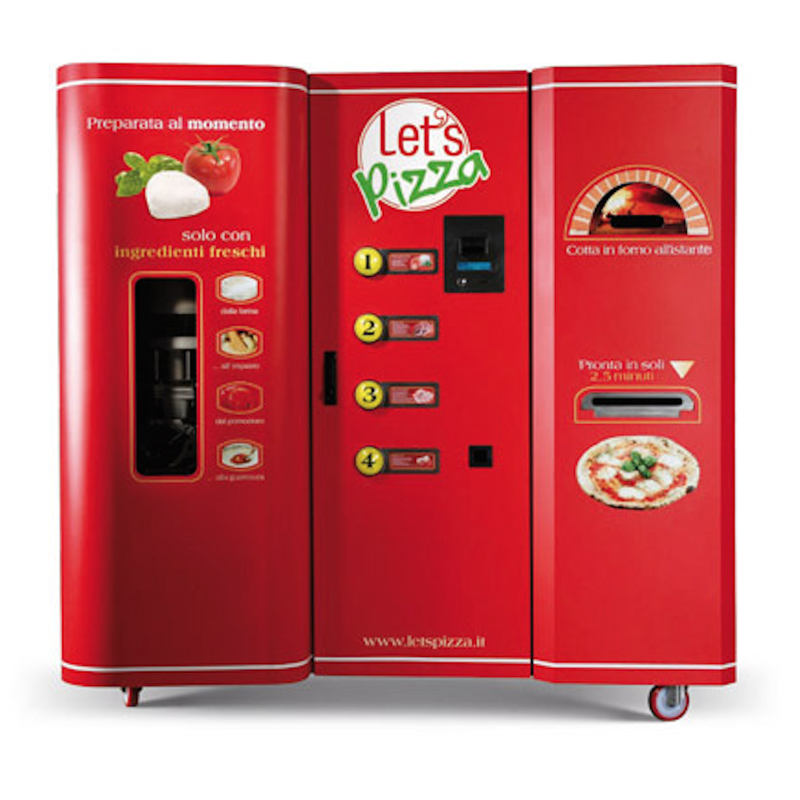 An Italian company called Let’s Pizza has launched a vending machine that can create a pizza from scratch in two and a half minutes flat. Now that’s what I call fast food. The machine kneads, stuffs, leavens, and cooks your pizza almost instantly, and the pie is served on a cardboard box. It currently comes with five different types of pizzas programmed, including classics Margherita and Pepperoni. Although pizza is not the healthiest food choice to say the least, Let’s Pizza does advertise on its website that its pizzas are light, healthy, and well, of course, delicious. While I don’t know how accurate it is to call a pizza light or healthy, Let’s Pizza’s pies are thin-crusted, so that alone makes them healthier than most. According to their website, each pie has an average of 676 calories. According to a Fast Company article, the machine’s founder had the idea for the machine while visiting a U.S. food court. As of now, there’s no date as to when these pizza-making machines will hit the U.S.